Organic and relatable. From Amazon Studios and Lionsgate comes Judd Apatow’s The Big Sick directed by Michael Showalter. Despite being billed as a romantic comedy (romcom), it is more like a family drama with comedic moments. 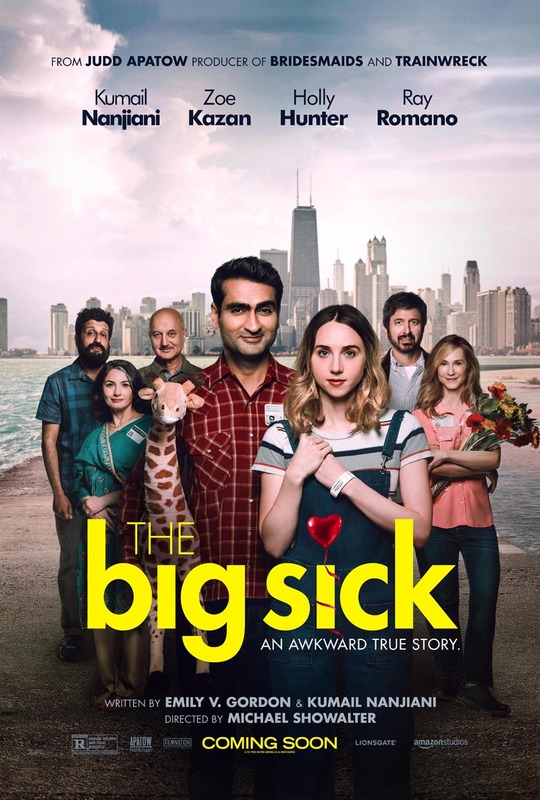 What makes the plot of The Big Sick so incredibly relatable is its central focus on two star-cross’d lovers caught between two seemingly incompatible worlds. Beyond featuring two people who fall in love quickly, then realize how there is little chance of a future in which they are together, this story has little in common with Romeo & Juliet. No feuding families or riots here, just two 20-somethings who are trying to make it in this world, and by sheer happenstance fall for each other. However, much like the families from which Romeo and Juliet came, there are two opposing forces at work in this love story. It is clear from the screenplay and cast that all the elements are at work to generate a response from the audiences that would make this an endearing classic in the vein of Terms of Endearment. The relatability and organicness of this film comes from the fact that the entire cast–not just the lead characters–are every-day 21st century Americans who are facing the real mountains and pitfalls of romance, acceptance, honesty, and devotion. The Big Sick tells the true-life story of the courtship between Pakistani-American Kumail (Kumail Nanjiani) and Chicago native Emily (Zoe Kazan). Kumail is a stand-up comic–or rather–he is desperately trying to be. He’s good enough for a small venue but he dreams of performing at the Montreal Comedy Festival. Emily is a graduate student at the University of Chicago studying psychology. Between family backgrounds and professional interests, the two of them could not be more different. When Kumail and Emily fall in love with each other, everything seems to be going so incredibly well over the next few months; but when Emily learns that Kumail cannot take the next step from dating to engagement because of his Pakistani family’s traditions regarding arranged marriage to a Pakistani girl, their relationship falls apart. As circumstance would have it, Emily must be placed under a medically-induced coma in order to stabilize after her health takes an acute turn downward. With Emily’s parents (Holly Hunter and Ray Romano) in town, Kumail must deal with his ex-girlfriend’s health condition and the fact that her her parents despise Kumail after he led their daughter on. Realizing that he cannot allow his family to determine his fate, Kumail is determined to win over Emilys parents and show Emily that he can be who she needs him to be. What sets The Big Sick apart from a typical par-for-the-course romcom is the dimension and depth of the plot and characters. Ordinarily, a romcom contains a lighthearted story that requires little critical thinking and analysis because it is meant to be simply entertaining with a little heart along the way. Great for date nights and girls nights. Often times, in a traditionally structures romcom, the female character is the most interesting with the rest of the cast playing a lesser role. However, in this film, the most interesting character is the male love interest. Furthermore, the character chemistry and plot are greatly helped by Kumail and Emily being interesting respectively. The underdog trope is often applied to romcoms, and it certainly played a role in this film. In addition to the character and plot development on screen, the audience also goes through some soul-searching. Incidentally, the movie opens the door of discussion regarding the predisposition to how Pakistani and Americans view marriage and dating. Just like past films that commentated on marriage or dating between the black and white communities–which is what was needed in the not so distant past–this film raises awareness regarding marriage and dating as it relates to middle-eastern and American relationships. A timeless plot told through a contemporary setting.